I met an artist drawing with charcoals and pencils while I was in the park today. "You must be very patient," I commented. "Your work is so intricate that I imagine it must take you a great deal of time." The sharpness of his reply surprised me. "It's actually quite the opposite. I am patient when I am not drawing and waiting until I can draw again. It's all I can think about. It is my passion." A shared with him how often my mind is on motorcycling when I am not actually on the bike. "I'm really passionate about traveling by motorcycle, not just being on a motorcycle. I have to be going somewhere to get excited." I thought about motorcycling as it's own form of art. 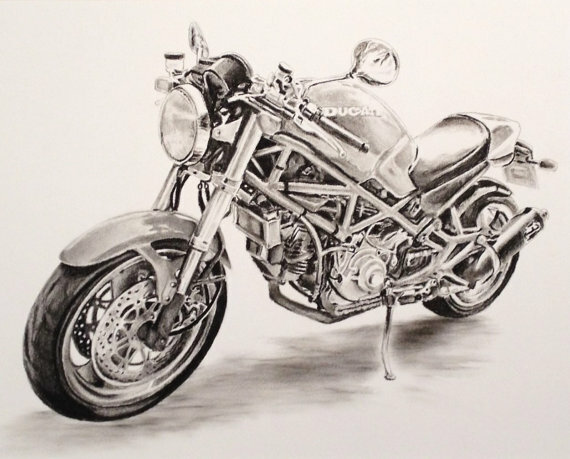 Each rider selects what motorcycle to ride, what style of riding to do, and the gear to wear, just as an artist may select canvas, charcoal and a subject. As the artist of my ride, I decide all of the variables. I can choose if I travel long distances, ride alone or in groups, just ride twisties on the weekend or take a long cruise under the summer stars. The development of my gear, modifications to my motorcycle, the way I pack my bags, where I go to eat, the people I choose to ride with and the roads you choose to ride. The artistry of motorcycling has an infinite number of combinations to create a unique style for each rider. As I watch the charcoal artist sketching a rubbing at each line and shadow, I think of each one of the drawings he creates as a new expression of his reality. I think of my motorcycle, my next road, and where it will lead me next. "You're lucky, you know. We both are." The sound of his voice jerked me back into the moment. "Anyone without passion is dead. They are missing something that they don't even know they are missing. They will never know what it is like to truly love anything. You're lucky you have motorcycling. You're lucky you have passion." Help me out by adding a little fuel to my bank account. My ebook, "Rude Biker Chick: Lessons From My Daddy" is available for purchase here. If not for you, buy a copy for a friend. The woman in your life will love you for it. Thanks! that a unique name for self promotion... and I don't think that everyone with passion is dead. "Anyone without passion is dead." I think you may have misread that. I love how riding is "art from the heart." And how you can be one with the road, alone or in groups. Get ready, Sky, Sash is coming!